3 Bedroom Detached Bungalow For Sale in Orpington for Offers in excess of £425,000. This property's price has dropped from £450,000 to Offers in excess of £425,000. This unique detached home comes to the market for the first time in over 35 years and is situated in a convenient location just half a mile from Orpington town centre. Deceptively spacious, the property has accommodation over two floors and enormous potential to extend further into the remaining loft space as stairs already exist for the 1st floor bedroom. The ground floor currently comprises a large reception room at the front, along with a good size kitchen and shower room with separate WC. To the rear, there is a double bedroom plus a dining room which could also be used as a third bedroom. Two of the rooms currently have a fireplace and one of the lovely features of the property are the handsome chimney stacks which enhance its character and charm. Modernisation will be required and the property is offered with NO ONWARD CHAIN. Outside, the garden to the rear is approximately 72' x 40' and has an expanse of lawn with mature flower and shrub borders. You will also find a detached single garage with a pitched and tile roof that can be accessed via the service road behind. Potential to create further off-street parking or build a larger garage exists at the end of the garden. 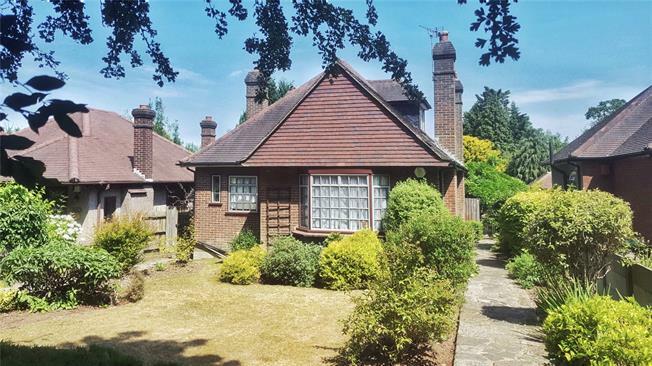 Orpington is a thriving suburban town within the M25 and therefore ideally situated for access to the motorway network and the railway stations that can transport you into London in as little as 16 minutes. The town centre has a comprehensive range of shops and facilities including the Walnuts Shopping Centre and Odeon cinema. Sports facilities are also well catered for with the Walnuts Leisure Centre, golf courses, football and rugby clubs all within the area. A little way out of town you will find larger stores at the Nugent Retail Park along with electrical superstores, furniture shops and DIY centres along the Sevenoaks Way. Larger shopping centres at Blue water and Bromley can also be found within 10 miles drive or bus ride.